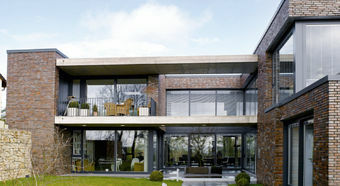 First impressions of the exterior of this modern detached house in Dortmund are shaped by its straight concrete elements and clinker facade. The varying floor plans of the ground floor and upper floor provide plenty of free space. Visitors enter the house through a half-open atrium, which opens up a view of the sky. 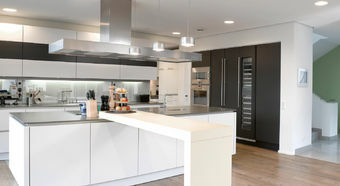 Inside the house, an open, continuous lower floor offers plenty of space for cooking, eating and family life. 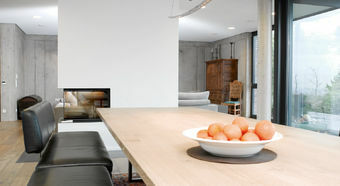 The walls’ cool exposed concrete contrasts with warm timber floors. On the upper floors are the private rooms of individual family members. Its advanced technical equipment is just as modern as the house’s architecture and as well planned as the arrangement of its living areas. 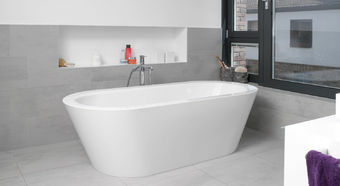 Based around the smart KNX system, most of the building technology comes from JUNG. 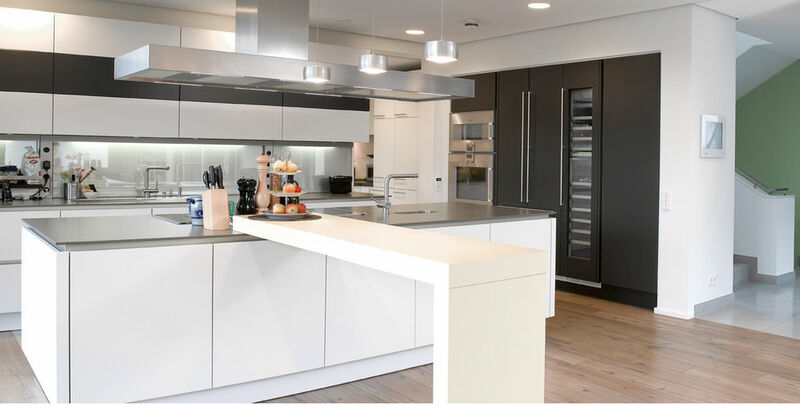 The JUNG Facility Pilot Server is the control centre, providing the house’s inhabitants with intelligent building technology that completely meets all their comfort, security and energy efficiency needs. A flat-panel computer with a 15-inch touchscreen in an Alpine White frame is centrally positioned between the entry and the kitchen. Here, the inhabitants can switch lights on and off, dim them, and regulate shade. All this can also be done from a tablet or smartphone from the comfort of the couch. 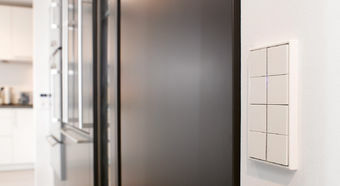 The room controller in the classic LS 990 switch design in Alpine White regulates lighting, heating and louvers in individual rooms. The weather station processes weather information such as wind speed, rain and light conditions, and adjusts shading, depending on the weather. 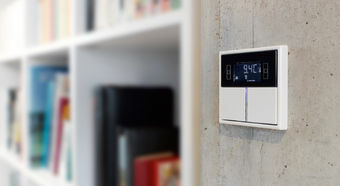 KNX automatic switches ensure security in the house, garage and grounds, with an alarm function, KNX presence detectors / ceiling detectors and an automatic guard. They register movement and can either switch on lights or set off an alarm. • Heating/cooling: The JUNG room controller’s integrated room temperature regulator adjusts the temperature. 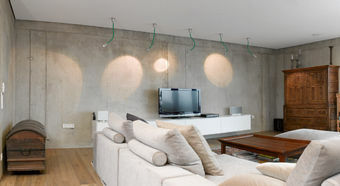 • The room controllers also regulate lighting. • Shade: The blinds roll up or down, depending on exterior lighting and temperature conditions, but they can also be manually adjusted at any time. • The weather station processes weather information such as wind speed, rain and lighting conditions and adjusts shading depending on the weather. 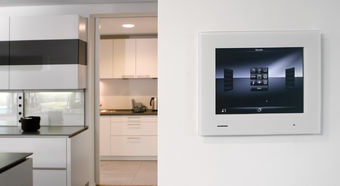 • The JUNG door communication system offers the highest security and convenience, enabling users to see anyone requesting entry to the house by video. 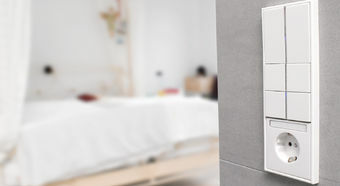 • JUNG’s presence simulation and KNX alarm system guard the house around the clock. The alarm system recognises and reports attempted break-ins. KNX Facility Pilot Server The KNX centre for the allocation, operation and visualisation of the building technology. This rail-mounted device has a pre-installed version of the JUNG Facility Pilot software and is consequently highly flexible. The KNX Facility Pilot Server is no longer available. Its successor is now the JUNG Visu Pro server.